Free Estimate 1-800-562-5438 - Read Our Reviews! PowerLift Foundation Repair is the industry leader in residential & commercial foundation repair. Here at PowerLift, we understand the importance of repairing your home or building correctly the first time. Get a free estimate today! Call us at 800-562-5438 for more information. Engineered and designed to provide the best results possible for raising and stabilizing residential and commercial structures. 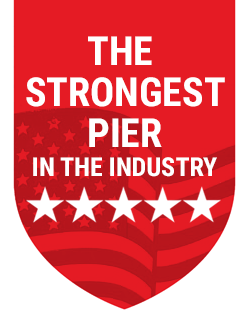 Using all new materials, Powerlift pilings are designed for extra strength and maximum corrosion resistance backed by a lifetime guarantee. PowerLift Steel Piers are driven through unstable soils to Bed Rock or a True Load-Bearing Strata. Steel Piers are driven to bedrock or load bearing strata providing long-term performance. Steel Piers penetrate unstable soil zones to depths not affected by seasonal moisture changes from one season to the next. Steel Piers are a proven method designed for easy installation, maximum elevation and cosmetic recovery and lifetime performance. Powerlift utilizes the most advanced synchronized lifting system available to minimize stress during the lifting process and provide maximum crack closure. Installation of Powerlift Steel Piers requires minimal landscape damage.